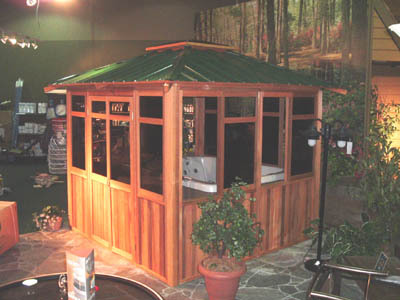 Pacific 8'x8' is a basic sized and fully enclosured spa hot tub gazebo with hip roof design. It is designed very streamline and sturdy. The 4x4 cedar posts at the corners hold all the walls and roof system very tight. The inside space is 8ft x 8ft. 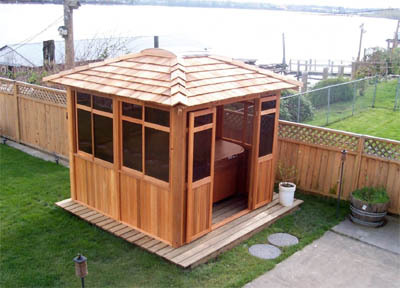 If you own a compact spa hot tub, such as 6'x6' , 6'x7' or rounded one, and don't want the gazebo to compete with your garden space, this model is a very good choice. Windows: 6 sliding windows and other fixed windows all glazed with thick acrylic glass. Corners: square shaped cedar posts. Skylight: 3' x 3' bronze skydome made with aircraft grade acrylic and UV protection property. Wall Dimension: outside 103"x103", inside 96"x96"
Gazebo height: about 9' high from ground to roof top.